Children involved in archery activity during the VBS day camp. During the summer each year, Mt. Olive Lutheran Church provides a no-cost Vacation Bible School (VBS) for children up to 12 years of age. We utilize the services of trained camp counselors from Idaho-based Lutherhaven Ministries. 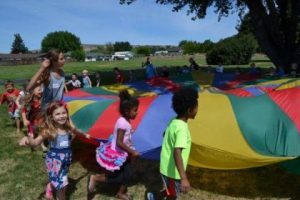 Each summer Lutherhaven sends their popular Community Day Camp programs to more than 30 congregations throughout the Inland Northwest! Mount Olive contracts with the Lutherhaven to send us camp staff people to conduct the five-day program, Monday through Friday. 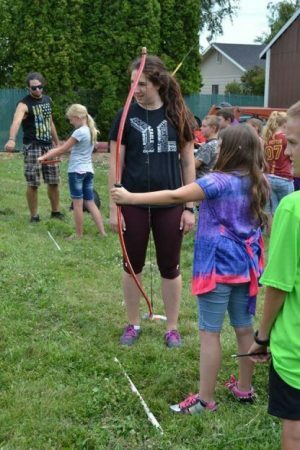 The staff plans numerous exciting activities, including games, camp songs, youth Bible encounters, worship, crafts, archery, and more. Our free day camp runs from Monday through Friday. It all takes place here at Mt. Olive Lutheran Church and Preschool. We invite all students up to 12 years of age who will be entering first through sixth grade in the fall to attend our VBS from 9:00 AM – 3:00 PM Monday through Friday. In addition, we invite those children who will be entering Kindergarten in the fall to Day Camp from 9:00 AM – 12:00 Noon. 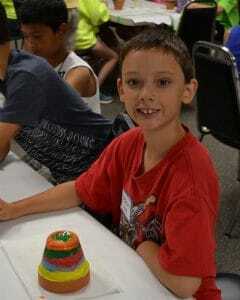 VBS children painting flower pots. To enroll please visit the church office. The office phone is 509-966-2190. Online registration is not yet available. To volunteer please contact the church office. The office phone is 509-966-2190. HI: I would like to volunteer. I live in Yakima, WA 98902. i have 2015 & 2016 experience. I also past the ministry safe training program. Am more than willing to submit to any background check, State ID & SS# check. You can email me any time. HI ! I would like to sign up my daughter for the day camp/ VBS on June 25-29 but I can’t find a registration form online. Can someone please help me know the process for signing her up? It looks like a really nice experience!